World Record -- 4lbs. 12 oz. These little scrappers are found in an extremely wide range across North America. Actually, they start out somewhere around the Quebec area, cover the entire USA, and extend their habitat into northern Mexico. Being a strictly fresh water species, they are very plentiful in waters everywhere. Bluegills are a member of the tropical sunfish family, and are not only a great fun little game fish, but also excellent bait for larger fishies like Largemouth Bass and Walleye. They are prone to hide in submerged cover (like bass), and can be caught on a wide variety of baits including hot dogs, corn kernels, and raw chicken. Old standards like night crawlers and bee moth work just as well. This fish will spawn around June in the shallows of their home water; usually in depths of 2 to 6 feet. This is the optimal time to snag up large numbers of them. Why? Because the males get very aggressive and will take just about anything you put in the water. Here's s a fun fact: the males guard the nests until the eggs hatch. Non-spawning males will assume the color of females to avoid the guarding males' aggression. Then they enter the nest and spawn. Sneaky little buggers, ain't they? Also known as Bream, Brim, Sunnies and Copperbellies, they will grow to a maximum of 16" long and weigh up to 3 pounds. The world's record is 4 pounds, 12 ounces caught in Alabama. But don't let their small stature fool you, as they are fighters and are a blast to catch! 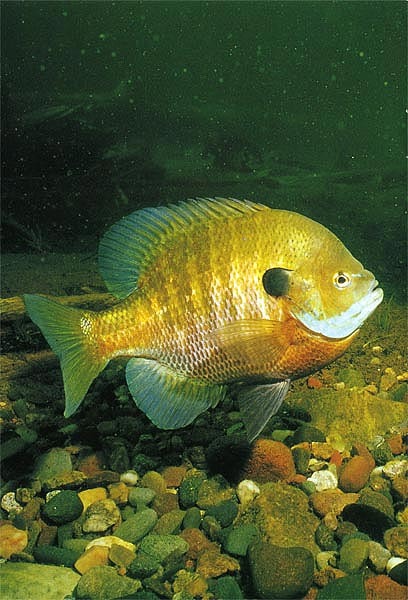 The adult bluegill will eat mostly small invertebrates and other fish smaller than itself. The best time to find them is at dawn and at dusk. They like to eat when the sun is either just coming up, or just going down. It is believed that this due to the presence of predators. All they really want is a peaceful meal without worrying about getting eaten or attacked by enemies. Since the approved nickname for these fish is "pan fish", guess how they are best prepared – IN A PAN, OF COURSE! Silly fish eaters… Take your Bluegill, clean it, scale it, pull off the skin, and flour it. Then pop it into a hot, buttered skillet and cook until a nice golden brown. MMM! MMM GOOD!! This is one of the best tasting fresh water fishes out there and is equal in flavor to Walleye, which a;so enjoys the rank of among the best tasting.